The show is hung, the food (and beer) is bought! Tonight is the opening for our show at Gallery 414. You’ll see me and photographer/friends Kipp Baker and Leo Wesson. We’ll be standing around, awkwardly waiting for people to ask us about the work and the like. Mostly we are looking forward to getting a chance to visit with friends and family. Opening is from 6 – 9 PM, at Gallery 414, located at 414 Templeton, in Fort Worth. Our website has a map, in case you haven’t ever visited this excellent venue. A big, big thank you to John Hartley and Adele Krause for making this all possible. Come! Enjoy! Bring your credit cards! Kipp has also prepared a little booklet (avaiable for purchase) with images from the show and a few bonus images from pieces we ran out of room for. If you sidle up to us and ask about them, we’ll take you to the back and give you a look at them. They’re also for sale. Tomorrow I’ll be posting images from the show. Come see them in person tonight. 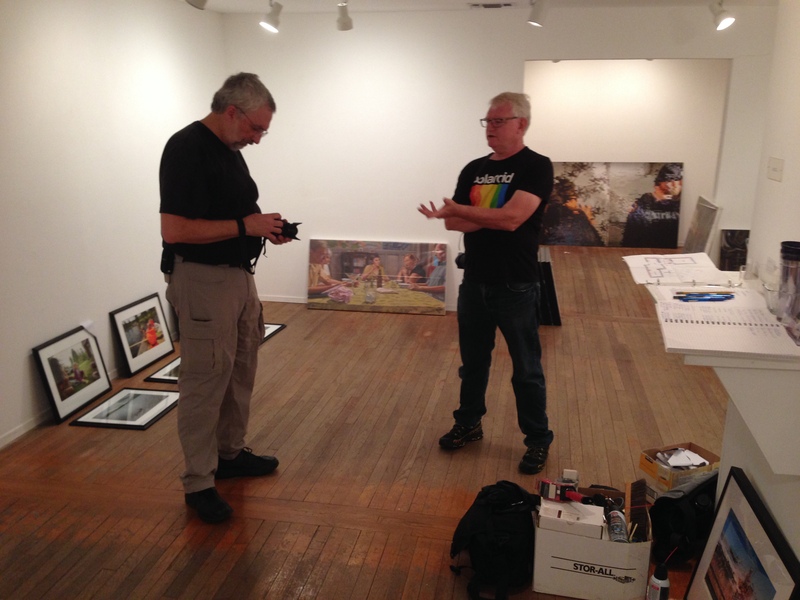 As a tease, here are Kipp and Leo at the gallery while we hung the show with John Hartley. ← New – now sign up for email updates!